Are you looking for the best possible laptop but do not want to spend too much? It’s difficult trying to find good gaming or office laptop within a budget when you have to do all the research by yourself. Luckily, you have come to the right place if you want guidance and reviews of the best gaming laptops under 600 dollars. In this article, we will guide you about things you should be looking for in a budget laptop before buying it. We will also share with you our list of Best laptops under $600 that we feel are the best in this budget. Buying a laptop within $600 means that you will have to make some compromises. When you are trying to find a budget laptop, you won’t be getting the latest tech and the highest possible storage at once. For example, there would be one laptop with an excellent display, but on closer inspection, you will find that the computer has a processor that is two generations behind the latest generation of processors. Alternatively, Probably, you will find a laptop that has specs that are far beyond what you were expecting but lacks a graphics card. We are not saying that the laptop will be of poor quality or not usable. These are among the best laptops for a casual gamer or regular business use. However, to fit the budget and still make a profit, the manufacturer has to cut corners. So, what are the things that you should look for when searching for the best laptops under $600? Here are a few things that you must look for in the laptop if you are a casual gamer or an average business user. It is easy to get confused when seeing the features of a laptop. Many brands advertise their features such as a great screen or large storage device, etc. However, the heart of any computer is its processor. The aim should be to try and get the latest possible processor. Intel’s 8th generation processors are the best processors in the market at the moment. If you can get this processor, you are golden. If not, try for 7th gen Intel processor. While the main focus should be on the processor, you shouldn’t forget to have adequate RAM and internal disk storage. Ideally, you should try to get at least 8 GB DDR4 RAM and 256 GB SSD or 1TB storage. Anything less than this is a compromise by 2018 standards. The modern standard for laptops in a display is Full HD Display (1920 X 1080), but you can settle for 1366 X 768 to stay within budget. Finally, the build quality of the laptop should be good as it will ensure the long life of your computer. Now that you understand the main things you must look for in a laptop, let us take a look at the best laptops under 600 dollars for casual gamers or regular business users. The Lenovo Ideapad 330 features the Kaby Lake R Intel Core i5-8250U 8th Gen processor with 8 GB of dual RAM, out of which 4 GB is hard soldered into the motherboard. Another 4 GB is installed additionally on the laptop. At first look, the body of the laptop looks premium and the design feels minimalistic yet modern. Although the body is made entirely of plastic, the body doesn’t scratch easily and feels sturdy. However, the laptop smudges easily and this could have been avoided. The laptop is less than one inch in thickness and weights 4.84 pounds. The hinges on the body are decent in quality, and the laptop can open up to 180 degrees. The laptop features a chiclet-style full keyboard, along with number pad. The key to key spacing and key depth is good. The synaptic touchpad has been placed in a good place and is large enough for regular gaming or business use. Coming to the display of the laptop, Lenovo Ideapad 330 gives you a 15.6 inch full HD TN LED screen. The display itself isn’t very bright, to be honest. Viewing angles of the laptop aren’t great either. Overall, although the laptop is full HD and should be sufficient for a regular business user or a casual gamer, it will disappoint someone who wants the best screen. Although Lenovo claims that the laptop will give you up to 5 hours of battery life, the battery doesn’t last more than 2 hours on average use. The laptop has Intel UHD 620 Integrated Graphics card which you can generally find in Kaby Lake R Intel Core processors. Although this won’t help you play the latest computer games at the maximum settings, you can still play most of the standard games. The integrated graphics card helps you watch most videos in HD quality without causing you any problem. One of the biggest USPs of this laptop is that it comes with 256 GB Solid State Drive Disk. An SSD drive has become a standard in most of the budget to high-end laptops today. Although the space given could have been 512 GB as in many other laptops, this should be sufficient for most casual gamers and business users. Unless you are looking to store your game collection along with your media collection, the storage should not be a problem for you. The laptop gives you an SD card on the right side, along with the headphone & mic combo jack. There’s also a USB 3.1 port and a DVD rewriter on the same side of the laptop. On the left side of the laptop, you will find a USB type C port along with one USB 3.0 port, one HDMI port, the Ethernet port, VGA and DC connection. Although great for casual gamers and average business users, the Lenovo Ideapad 330 comes with an average display. The processor and RAM are excellent, and the SSD drive adds an edge to the laptop. However, the storage space could have been larger. The laptop also lacks a dedicated graphics card, which will sting you when you want to play the best games. However, at $609, this is among the best picks for a budget gamer or business user. Slim, compact and lightweight, Asus Vivobook S15 is one of the best budget laptops on the market right now. Asus Vivobook stands out in the crowd of boring looking laptops. Asus offers many color schemes for the user. You can either select Icicle Gold, Gun Metal, Silver Blue, Star Grey or Firmament Green color scheme for your laptop. The laptop also offers the Asus Ergolift hinge design which improves airflow and makes the laptop more stable. Although made mostly of plastic, the build quality of Asus Vivobook S15 looks premium and modern. The laptop is sturdier than the previous Asus laptops and should last a long time. The laptop screen goes back up to 140 degrees. Although this looks limiting at first, this should be more than enough for most business users or casual gamers. Unless you want to design something on a touchscreen, 180-degree screen rotation isn’t essential. The display of the laptop is IPS 1902 X 1080 pixel full HD screen. The screen is an LG Philips panel with good contrast and decent enough viewing angles. Again, the panel isn’t as bright as some of the top end displays, but this should be enough for an average business user or gamer. The keyboard of the laptop is decent enough with full keys and a bit cramped number pad. The key spacing is good, and you can type fast with some practice on the laptop. Asus offers a backlit keyboard which should be helpful in dark environments, and the laptop also has an inbuilt fingerprint sensor. Vivobook S15 comes with Intel Core i5-8250U processor which can clock up to 1.6 GHz frequency and can turbo boost up to an amazing 3.4 GHz. The laptop offers 8 GB DDR4 RAM and has an SSD drive with a storage capacity of 256 GB. The combination of an Intel core i5 8th generation processor with 8 GB DR 4 RAM and an SSD disk gives you great experience, and the laptop feels snappy. However, if you want to store lots of large files on the laptop, you will be disappointed with the 256 GB storage. Although the laptop is really good in terms of hardware overall, it does lack a dedicated graphics card. The laptop comes with an integrated UHD graphics 620 card which is capable of handling video streaming, normal gaming, and everyday usage but doesn’t work well with the latest games at high settings. The laptop comes with a 42 Wh battery which gives you approximately 3-4 hours of battery life with medium usage. 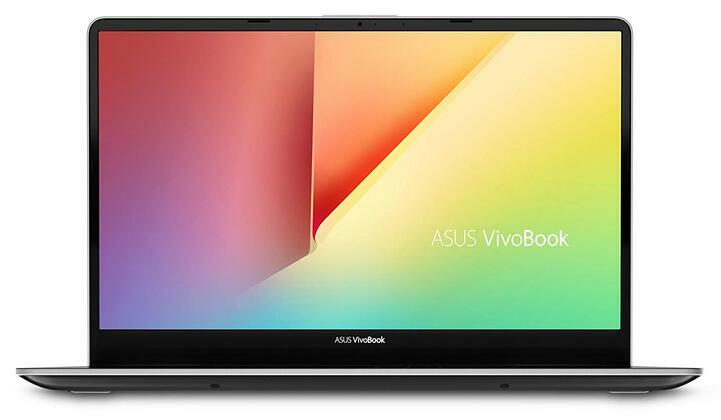 If you are looking for a laptop around $600 price range and you are an average business user or a casual gamer, Asus Vivobook S15 should easily be your choice. The laptop is aesthetically appealing, and the new design and color schemes make you love the laptop. Although the device comes with the latest core i5 processor and 8 GB DDR RAM, the 256 GB SSD drive may be a let down for some in terms of storage space. Finally, the laptop lacks a dedicated graphics card. 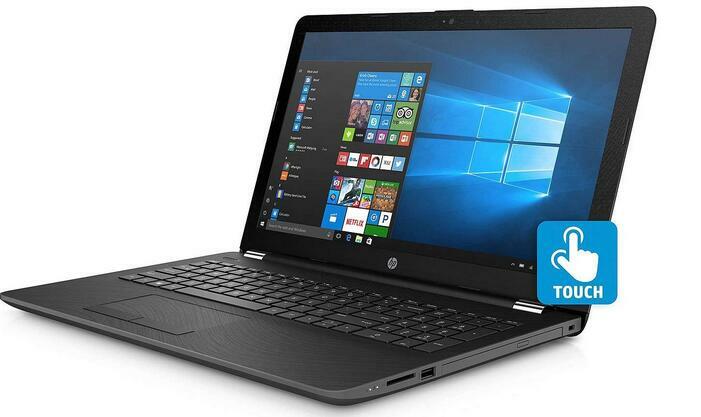 Overall, at the price range its available in, the laptop works great for a typical business user or college student. Although most users look for a 15.6-inch screen when looking for a laptop, a 14-inch screen is excellent for business users who want smaller screens. Acer Swift 3 SF314-54-56L8 comes with a 14 inch Full HD Widescreen LED-Backlit IPS display. The screen rotates up to 180 degrees, and the laptop is ultra thin. Although not touchscreen, this is one of the best laptops in this budget. 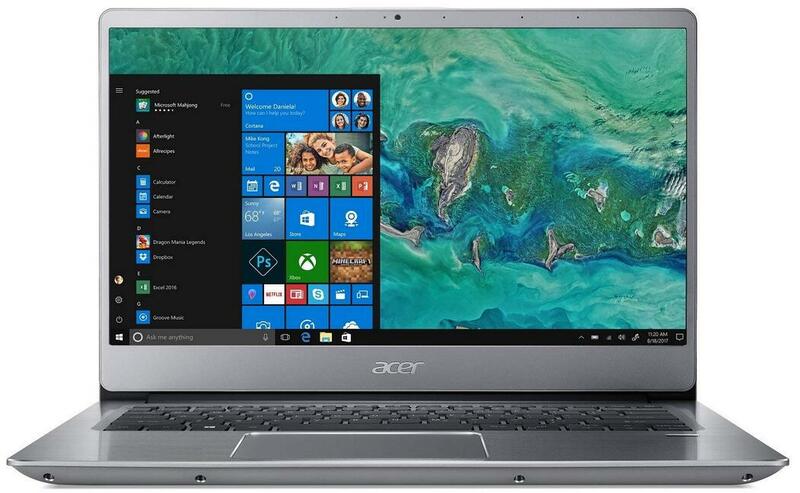 The Acer Swift 3 is powered by an Intel Core i5-8250U processor, which can clock up to 3.4 GHz frequency. Coupled with an 8 GB DDR4 RAM, the excellent performance of the Intel processor makes the laptop very quick and gives you a big jump in performance over the previous versions. The laptop also adds on a 256 GB SSD drive. Although the storage space is not huge, the SSD drive makes your laptop run like a breeze. You feel the difference if you are buying a new laptop after a year or two. When you get your hand on the laptop, its slim, all-metal build gives you a great first impression. The laptop looks and feels premium. The front panel of the laptop is made of glass and has a protective rubber strip surrounding it. It looks and feels like a MacBook Pro, and that’s the first impression you will get. The laptop is super thin at just over 18mm width. However, it still weighs approximately 3.2 pounds. Acer promises over 11 hours of battery life on the laptop. However, with moderate video streaming usage, most users have reported that their laptop lasts approximately 8 hours. Moreover, if you were to use it heavily with lots of multitasking, it still lasts over 3.5 to 4 hours, which doesn’t sound that much until you see the battery performance of other laptops in the same range. Like most other laptops in this budget range, the Acer Swift 3 also comes with an integrated Intel UHD Graphics 620 graphics card. For most business users and casual gamers, this should be enough. However, for heavy gamers, an additional dedicated graphics card may be necessary. In terms of connectivity, the laptop comes with one USB 3.1 Type C Gen 1 port, two USB 3.0 Ports, one USB 2.0 port and one HDMI port. Many users have reported that the laptop gets warm faster than average laptops of this range. Although the metal body should help remove heat faster, the laptop needs to improve in this regard as many users are complaining about this problem. Acer Swift 3 is among the best laptops in the $600 to $700 range. It comes with tons of useful ports, has a great FHD Display, gives an excellent performance for a casual user and has a battery that lasts long for this budget range. However, the laptop lacks a dedicated graphics card, and the screen could be brighter. Overall, the laptop is an excellent companion for the on-the-go user because of its screen size, weight and battery life. This HP High-Performance Laptop comes with 15.6 Inch High Definition Touch Screen display, 8th Gen Intel Core i5-8250U quad-core processor, 8 GB DDR4 RAM, 2 TB Hard Disk Drive + 128 Solid State Drive and Windows 10 Operating system. Although not a full high definition display, the touchscreen high definition display provides a resolution of 1366 X 768 and should be enough for most casual users. We do feel that a full high definition display is standard in laptops today and HP should have added the same. The laptop’s 8th Generation Intel Core i5-8250U quad-core processor is standard in laptops of this range. It is the fastest processor r available in this budget at the time of writing this article and should serve you well for a few years. One unique thing about this HP High-Performance Laptop is the storage of the laptop. Unlike many laptops that choose between a regular hard disk drive and a solid state drive, HP has decided to go ahead and add both of them in the same laptop. 128 GB of SSD makes your laptop snappy, quick to load and runs your programs effectively. The additional 2 TB of HDD gives you enough storage space to keep all your large media, gaming, and other files. The laptop has a now standard 8 GB DDR4 RAM which should serve you well and let you run many programs at once with ease. Although many top-end laptops now come with 16 GB RAM and a few go with as high as 24 GB RAM, 8 GB should be enough for most regular users. There is no dedicated graphics card on the laptop. The laptop has Intel UHD Graphics 620 Graphics card integrated into the system, and it runs most videos and small games successfully but fails at the modern games if you try to play them at the highest settings. For regular business users or casual gamers, this shouldn’t be too much of a concern if you are looking for a budget laptop at this price range. Regarding connectivity, the laptop brings you two USB 3.1 Gen 1 (Data Transfer Only), one USB 2.0, one HDMI, one RJ-45, one Headphone-out/microphone-in combo jack, and one Media Reader. The laptop is also equipped with Bluetooth 4.0 and has an integrated webcam. Users have complained that although the style of the laptop looks decently modern, the quality of plastic used in the laptop feels cheap even for this price range. Although the laptop looks premium and the hardware is among the best except for graphics, the build quality is a cause for concern. The SSD Drive coupled with the breezing fast processor and the 8 GB DDR4 RAM make the laptop super fast to use and run. Unlike most other laptops in this range, the laptop comes with 2 TB Hard disk drive along with the 128 GB SSD. 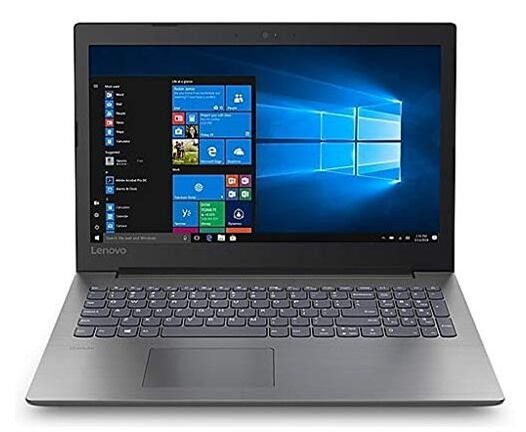 Overall, this is an excellent laptop for everyday use, and at the price point of just over 600 dollars, this laptop can be considered for long-term use. The Dell Inspiron 15 5000 contains Intel’s 8th Gen Quad-core i5 processor which clocks an amazing 1.6 GHz per core frequency. This is mostly standard in laptops of this range. It also houses 8 GB of DDR4 RAM which should be sufficient for running any kind of multitasking in today’s age. Unless you are running 2-3 heavy programs at once, the RAM should prove to be more than sufficient. The device comes with a 15.6 inch full high definition IPS Truelife LED Backlit Touchscreen display, with a resolution of 1920 X 1080 pixels. The Truelife technology being offered by Dell gives you brighter colors and keeps the experience closer to reality. Unlike most other laptops in this price range, the laptop gives you a touchscreen display. For creators and designers of any kind, this can be a godsend. One drawback of this laptop over others in this list is that this laptop doesn’t have an SSD disk storage. Without an SSD Drive, your laptop won’t run as fast as it should with an i5 8th generation processor and 8 GB DDR4 RAM combo. We highly recommend adding on an SSD drive to the laptop to see how quick your computer can get. The laptop instead offers you 1 TB of Hard Disk space, which should be enough to store all your files. Like most other budget laptops, Dell Inspiron 15 5000 doesn’t have a dedicated graphics card installed on the machine. Instead, it offers Intel UHD Graphics 620 integrated graphics card, which should be sufficient for most day to day work. However, heavy gamers may be disappointed with the performance of the integrated graphics card and may want to install a dedicated graphics card. Weighing at just 2.65 pounds, this is one of the lightest laptops in this budget category and should feel great to business users who carry their laptop around with them. Although Dell claims that the battery life of the laptop is approximately 5 hours, users reported that the battery barely lasts 3 hours with moderate to heavy usage. The laptop also offers a full keyboard with a number pad. The spacing between the keys is good, and you can get used to typing fast with this laptop. A touchscreen laptop within $600 is like a dream come true. Powered by i5 8th gen processor and 8 GB DDR4 RAM, the laptop is really quick and can multitask. However, the laptop can be much faster if you install an SSD drive. The laptop is lightweight and gives average battery life. Overall, for the price the laptop is being sold for, this is one of the best laptops in the market, and for a casual gamer for a normal business user, this laptop should prove to be more than sufficient. Designed for gamers looking for a budget laptop, Asus FX504 packs an impressive list of hardware. It comes with an Intel i5-8300H processor which can clock up to 3.9 GHz frequency. As any good gaming laptop would do, the computer has a dedicated graphics card. 2 GB of GeForce GTX 1050 is good enough to play most old and new games at medium detail settings. Asus FX504 also packs a blazing fast 8 GB of DDR4 2666 MHz RAM which makes multitasking a breeze. You can run many browser tabs at once while also playing your favorite game and the RAM won’t disappoint you. Combined along with FireCuda 1 TB SSHD drive, your laptop will load all your programs and games amazingly fast. Asus benchmark tests have shown that the SSHD drive is five times faster than normal hard disk drives. 1 TB of storage space should also be sufficient for most gamers to store their games and media files. The laptops’ exterior is built completely out of plastic, and it gives it a cheap look and feel when compared to laptops with metal bodies. The overall design of the laptop shouts ‘gaming’ and is aesthetically pleasing. However, other gaming laptops seem better. 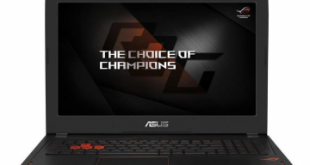 Asus advertises that it is a light gaming laptop and it is right to an extent. When compared to a standard budget laptop, Asus FX504 feels heavier at just above 5 pounds, but it is lighter than most other gaming laptops. Regarding connectivity options, the laptop comes with 3 USB ports (2 USB 3.1 Gen Type A and 1 USB 2.0), one HDMI port, an ethernet port, a headphone/mic jack, and 802.11 ac wireless connectivity. The keyboard provided in the laptop is top-notch too. Asus outlines the WASD keys in red, and the keyboard is backlit. Even the backlit brightness for the keyboard has three different levels when compared with competitors who offer only on or off. The one area where we feel the laptop disappoints from a gaming perspective is regarding the display. Although the device comes with a full HD display, the display is not an IPS display. Instead, Asus has used TN panel, which results in poor viewing angles. If the screen is even slightly tilted back or forward from the perfect viewing angle, the display starts to wash out, and you begin to see inverted colors. Even at a perfect angle, the colors don’t look as bright as in IPS displays, and the color contrast isn’t something to brag about either. 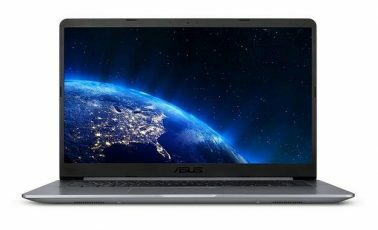 Asus FX504 laptop is built for the budget gamer who is looking for the best specs at a reasonable price. The processor, SSHD storage and blazing fast RAM make this computer snappy. This computer will be a delight for any casual gamer with a tight budget. However, the display is one part where the laptop could have been better. At $699, this is one of the best budget gaming laptops on the market. The 2018 Lenovo Business Laptop comes with 8th Gen Intel Core i5-8250U quad-core mobile processor which allows four-way processing performance in your laptop. The processor can handle most tasks pretty quickly. Combined with 12 GB DDR4 RAM, this Lenovo laptop won’t have any performance handling multitasking. You can run multiple applications and have many tabs running in your browser at once, and the computer will handle it like a breeze. Storage space on the laptop is 1 TB, which should ideally be more than enough for a typical business user. Even for a business user with an extensive collection of media files, 1 TB storage should be sufficient. However, the laptop lacks an SSD drive, and this leads to slightly slower performance. The computer could have been much faster if Lenovo had added an SSD device instead of the standard hard drive. Few users have reported that the laptops’ initial loading time is higher when compared to similar budget laptops. Concerning display, Lenovo offers a 15.6-inch high definition touchscreen display on the laptop. While most laptops in this range provide a full HD display, very few offer a touchscreen display. For business users who design stuff, a touchscreen is an added advantage. 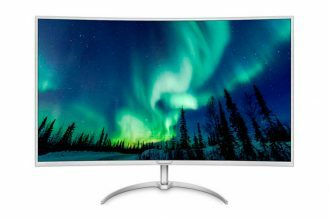 We do feel that Lenovo could have added a full high definition display as it has become a standard at this budget range nowadays. The laptop doesn’t have a dedicated graphics card and instead has an integrated Intel HD Graphics 620 card which can run most videos and small games smoothly. You shouldn’t face any issues while running everyday applications, internet video browsing or while viewing or editing photos. However, heavy gamers will not find the laptop suitable for playing most new games at medium or high settings. This business laptops weighs 4.8 pounds and is 1 inch thick and feels larger than it should feel. Regarding connectivity, the laptop comes with Bluetooth 4.0 and has 1 USB 3.0 port and 2 USB 2.0 ports. An HDMI port and an Ethernet port are also available on the laptop. The keyboard is a full keyboard with a numeric keypad. Intel i5 CPU gives the laptop excellent processing power and 12 GB DDR4 RAM allows you to multitask without any fear. Although the display is not full HD, it is sufficient for typical business usage. The touchscreen display is an added advantage and would serve the designer community well. Overall, the laptop has been designed with an average business user in mind and in that regard, it serves its purpose. The Acer Spin 3 convertible laptops’ body is mostly made out of plastic. The laptop’s build quality is good, and the device feels rigid. The Acer Spin 3 has three USB ports for connectivity; two 3.1 Gen 1 ports, and one USB 2.0 port. All the three ports are type A. The laptop does not have any Type C port and users may miss the same. There’s also one HDMI port and a built-in SD card reader available on the computer. The notebook has a chicklet-style keyboard. However, the keys are not backlit. The keyboard quality is good, but there’s no number pad available. However, you can’t expect a full keyboard in a 14-inch laptop without compromising on keyboard quality. The laptop features a 14-inch Full High Definition display with a native resolution of 1920 X 1080. The contrast ratio of the computer is also good at 1222:1. However, the brightness of the display could have been better. The color reproduction is good, and the viewing angles are excellent because of the IPS screen. For designers, the laptop can be awesome as it supports 10-point touch, which means you can use up to ten fingers on your screen, at once. This 14-inch convertible provides great performance for typical business users. The laptop is powered by Intel Core i5-8250U Processor which clocks a frequency of 1.6 GHz and can be boosted up to an amazing 3.4 GHz. The laptop features a 256 GB SSD drive which when combined with the 8 GB DDR4 memory makes your laptop lightning quick. However, users who want to store lots of media files and games on their laptop may find the storage to be insufficient. There’s no dedicated graphics card on the laptop. The Spin 3 features Intel’s UHD Graphics 620 which should prove to be sufficient for most image editing and casual gaming. You can most normal games on low to medium display setting. Acer boasts that the battery life of the laptop lasts over 12 hours. However, users have reported that the laptop lasts approximately 8 hours when used lightly and the battery life is lower with heavy usage. Acer Spin 3’s 14-inch convertible laptop has all things necessary for a typical business user. There’s a powerful processor, a fast 256 GB SSD storage and 8 GB RAM. The battery life is good, the display is great and there are many ports available for connectivity. A touch screen display with 10 finger touch support is something designers and creative users will love. Overall, we recommend this laptop for business users, designers and casual gamers. Dell Inspiron 13 5000 convertible gives you a touch display with a 360-degree hinge. The 360-degree hinge allows the 2-in-1 notebook four different modes. These are the tent mode, the stand mode, the laptop mode, and the tablet mode. Although the laptop feels a bit heavy for a 13.3-inch display, the 3.5 pounds device packs a lot of power. This convertible laptop is among the first ultraportable laptops to boast true quad-core performance because of its Intel Core i5-8250U processor. Moreover, it comes with the integrated Intel UHD 620 Graphics card, which can smoothly run most day to day tasks efficiently and is suitable for casual gaming. The Dell Inspiron laptop features a 13.3-inch IPS display which has a 1920 X 1080 resolution, making it full high definition. The screen is sharp, and the viewing angles are good. The brightness is approximately 208 nits and could have been better. The touchscreen itself is also pretty good and is very responsive. A 256 GB SSD drive ensures that you have enough space available for regular business use. However, if you are looking for enough space to store entire media libraries, you may need an external hard disk drive. The SSD drive makes your laptop run faster, gives it longer battery life and makes it quieter. The fast processor, the SSD drive and the 8 GB DDR4 RAM make the laptop snappy, and you can feel the difference between the loading and response time of this laptop with notebooks of older generations. The device features a backlit keyboard which has nicely spaced keys, but there’s no numeric keypad (as expected in a 13.3-inch laptop). The trackpad on the device is also adequate in size and is accurate. There’s one HDMI port, two USB 3.1 Gen 1 ports and a headphone jack on the left side of the laptop. On the right side of the computer, we have two USB 2.0 ports and an SD card reader available. There’s no ethernet or VGA port on the machine. The Inspiron laptop is built for portability, and it shows in the long battery life of the computer. Even with medium to heavy usage, the laptop runs for over five and a half hours. 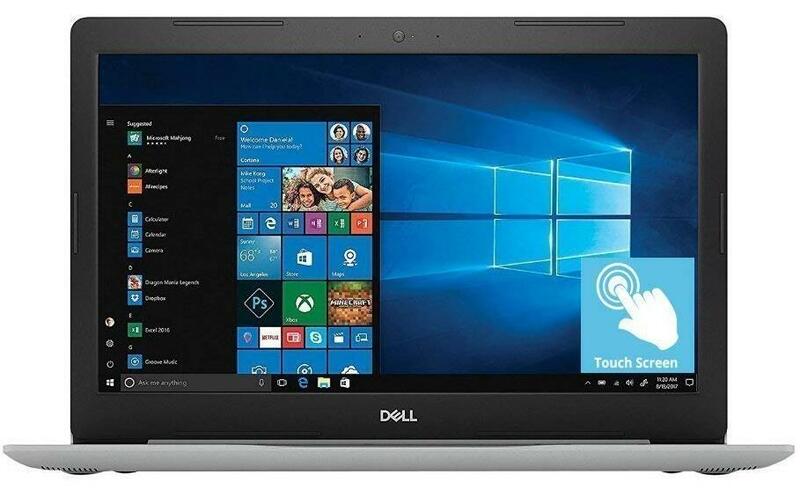 A quad-core processor, a 360-degree touchscreen display, an SSD drive, and a reasonable price tag make this Dell laptop an excellent choice of ultrabook for budget users. If the display was brighter and the computer had a dedicated graphics card, the notebook could be among the best in the market. Overall, it is an excellent choice for typical business users and casual gamers. Previous Nvidia GT 1030 vs AMD RX 550: What’s the difference? Which is better?